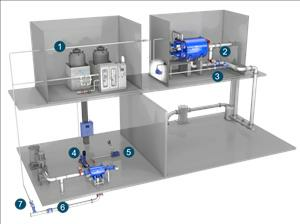 U.S.-based ballast water treatment system (BWTS) manufacturer Ecochlor, Inc. said it has been awarded a contract to retrofit 36 vessels, including Suezmaxes, Aframaxes, VLCCs, Minicapes and Capes for Angelicoussis Shipping Group Limited (ASGL). Installations are expected to take place between 2018 and 2020 in Singapore, Dubai, Qatar and China. Ecochlor CEO Steve Candito remarked, "Having both IMO and USCG Type Approval were very important factors in the selection process by ASGL. Our expertise as well as the system's ease of use and reliability are critical issues to shipowners as they look for manufacturers that are absolutely committed to making sure their vessels are in compliance with BWT regulations now, and for the life of the vessel." Greek-owned company ASGL has a fleet of bulk carriers, tankers and LNG carriers. Maran Tankers Management (MTM) manages the Oil Tanker Shipping unit, and in 2001 Anangel Maritime Services Inc. (AMSI) was appointed to manage the bulk fleet. "We look forward to working with both Maran and Angangel to retrofit their fleet of vessels and continuing to support their efforts in satisfying regulatory compliance. Our BWTS are setting the standard in the ballast water treatment industry for operational performance and reliability," said Tom Perlich, President of Ecochlor. Over the past two years, the Ecochlor BWTS has been installed on dozens of tankers with ballast water flow rates ranging from 750 to 6,000 m3/hr. These installations were performed at shipyards in China, Croatia, Romania, Portugal and Turkey. Currently, there are two bulk carrier newbuilds installations in process in China and four tanker retrofits scheduled over the next few months.